The second leg of my California journey began when I showed up on the doorstep of my friend Dennis who lives in the suburban Bay Area community of Walnut Creek. His home was my home for a couple of days while I saw some of the sites in and around San Francisco. With Dennis guiding the way, our first stop was Muir Woods National Park and its 200 plus acres of California redwoods, the tallest trees in the world. The drive took us through Berkeley and up and down the hairpin turns of Muir Woods Road before we reached the park’s entrance. It was a rainy Wednesday afternoon, but neither the precipitation nor the occasional congestion of tourists on the trails detracted from the experience of walking through a wonderland of nature-made skyscrapers. Apart from the enormity of the trees, the first thing to catch one’s attention is the smell. It’s pungent and pleasing in the same way eucalyptus is, but earthy, woodsy, and musty. 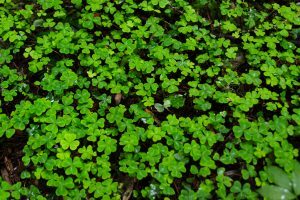 Coincidentally, on the same day we went to Muir Woods, a video circulated on Facebook about the health benefits of “forest bathing.” A Japanese study found that trees emit a protective oil that is also beneficial to people. No running, rock climbing, or strenuous activity is required. Mere contemplation among trees slows down heart rates, lowers blood pressure, and reduces stress. 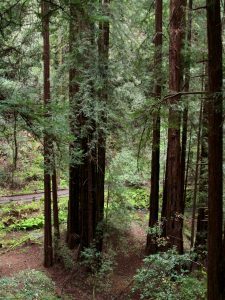 My own unscientific conclusion is this: the taller the tree the better, so the best of all possible places “to bathe” in a forest must be the seven-county expanse where Muir Woods is located. Five of the counties are in northern California, two are in southern Oregon, and combined, they form the Redwood Empire. Finding myself living in Las Vegas (long story), I decided to make a trek up the California coast and back down again, beginning in Costa Mesa, home of a dear childhood friend who graciously put out the welcome mat for me four months ago when I first landed in the Pacific time zone. From Costa Mesa, I meandered north, stopping in Hermosa Beach to have lunch with a fellow education reporter from my writing days for the Bill & Melinda Gates Foundation. Next up was a nearly 400-mile stretch to the Bay Area in and around San Francisco to visit with fellow reporters from way back, from the 1980s when I was working for United Press International in Guatemala. The best part of my California journey was seeing old friends and colleagues, but the scenery wasn’t bad either. Here are a few highlights from the trip north. The CAMP parking lot, Costa Mesa, Calif. In Costa Mesa, a coffee shop called the Blackmarket Bakery very quickly became my office. It’s located in a wonderful cluster of restaurants, shops, and cafes called The CAMP, where the parking spaces say it all. Instead of numbers to be punched into a parking meter, each one has a zen-like message. 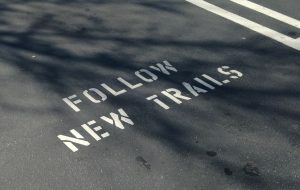 Two of my favorites were “Follow New Trails” and “See the Forest.” And the pastries at the Blackmarket Bakery, especially a bread pudding made from chocolate chip, snickerdoodle, and molasses toffee cookies, are delicious. 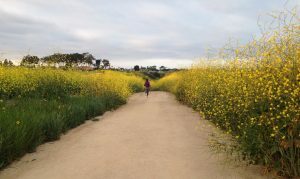 Also worth checking out in and around Costa Mesa are the meandering marshland trails of the Newport Back Bay, and Crystal Cove State Park, 2,400 acres of seaside wilderness that that includes 3.2 miles of coastline, a remodeled seaside colony from the early 1900s, and 15 miles of hiking trails, not to mention the vast selection of top-rated milkshakes at Ruby’s Shake Shack. Newport Back Bay, Costa Mesa, Calif.
My next stop was Hermosa Beach, which packs a lot into its 1.5 square-mile expanse — most notably biking, bars, sunbathing, surfing, and, above all, volleyball. I’m guessing there are good eats in Hermosa at every turn. If you’re looking for a low-key sandwich shop with sidewalk seating, Gum Tree Shop & Café is a good place to go, and its turkey, tomato, and avocado sandwich with sweet chili aioli on sourdough proved to be a good choice for lunch. 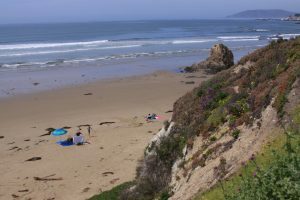 Leaving, Hermosa Beach, I headed north with no agenda other than to skip some of the main attractions — e.g., Hollywood Boulevard, Santa Barbara, Hearst Castle — and to keep an eye out for off-the-beaten-path destinations, which led me to the following gems…. 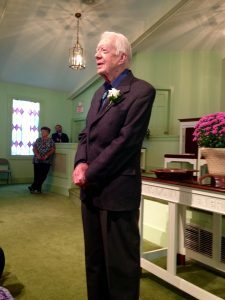 President Carter at Maranatha Baptist Church. Jan Williams, in the background, keeping an eye on the class. George Williams arrives at the Maranatha Baptist Church parking lot in Plains, Georgia, Sunday mornings at 5 a.m. to give out numbers to those who show up for President Jimmy Carter’s Sunday school class. My friend Sharon and I pulled into the lot at around 6 a.m. last Sunday, early enough to be third in line and get a front row seat just a couple of feet from where Carter would speak later in the morning. We still had four hours to go – an hour of waiting in the car, an hour allotted for visitors to file through the Secret Service checkpoint, and two hours of the Jan Williams show, a delightful blend of humor and menace aimed at keeping us entertained while making sure that no one broke any of the rules involved in attending Sunday school with the 39th president of the United States. Jan is George’s wife as well as a no-nonsense former teacher who, no doubt, had few, if any, discipline problems in her classroom, and she wasn’t going to have any with us. When Carter walked into the church sanctuary, she told us not to stand up or applaud; during the photo op, he would be seated on a stool and we would not shake his hand or put our hand on his shoulder; nor would we talk to him other than to say “Good morning. Glad to be here,” and if we did address him by name, President Carter or Mr. Carter would be “perfectly fine.” Mr. President, she said, was not an option, because he’s not the president, and references to him being an ex or former president were not necessary. “He’s aware of that,” Jan said. As 10 a.m. approached, Jan wrapped things up by telling us she ‘d be standing at the front of the church, off to the side. “All you have to do,” she said, “is glance my way and you can tell if you are the gifted class or not.” With that reminder, she took her place on the sidelines, and President Carter walked into the room. This has been a challenging year in many ways. It started off with way too much funkiness at the duplex where I lived, so I decided to move out, and not knowing where I wanted to live, I moved to nowhere. I put most of my stuff in storage, a lot of it (too much) in my car, and spent the next four months either house sitting or staying with friends. All of this was my choice, but it’s not been easy, and I will forever be grateful to those who have been incredibly generous along the way — those who helped with the move itself (it’s harder to move to nowhere than one might think), the many who have offered me a place to stay, and the many more who have helped out in a thousand other ways. Now I’m in Spain, and while my month-long stay here has been a great journey, it, too, has had its challenges. I’ve sliced up two fingers at this point, eluded a creepy Airbnb situation, endured a serious bout of food poisoning, and still to come, getting home in the middle of an air traffic controllers strike. An unexpected and much needed ride from a Camino de Santiago volunteer. The friends, acquaintances, and medical personnel who helped me get through four days of the runs and the first of the two sliced fingers. 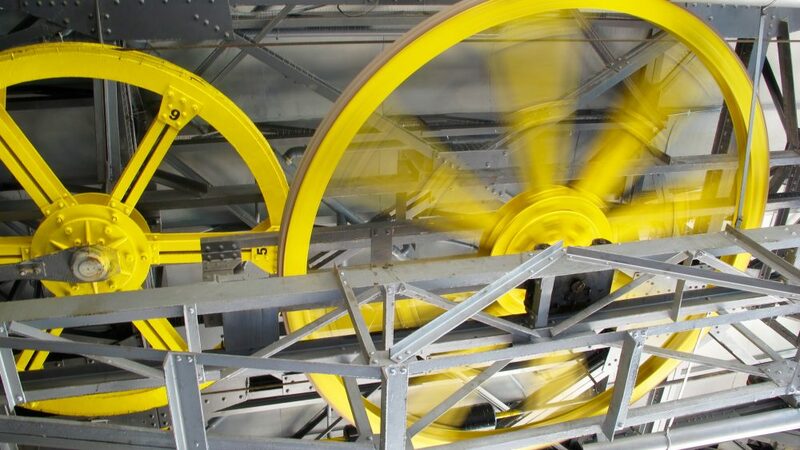 A cable car ride with a woman from Australia, which led to a wonderful conversation over lunch about the trials and tribulations of being a solo female traveler, a conversation that, in the end, left me feeling much less solo on the road. A chance meeting at a laundromat with a graduate of the South San Antonio Independent School District, once part of my beat at the Express-News. The South San alum is now a wedding photographer, so as we waited for the clean, rinse, spin and dry cycles to do their thing, we had a great time talking about photography, tapas, and SSAISD. And then on Sunday, a mini contingent of guardian angels fell from the sky. The Prada family — Chema, his wife Inma, and their two children — are friends of friends who adopted me for the day. They gave me a driving tour of Madrid, fed me lunch, hung out all afternoon as if they had all the time in the world, took me on a guided walking tour back to my hotel, and made it very clear that if anything came up, anything at all, to give them a call. I didn’t know the Pradas before Sunday, yet they treated me with incredible generosity. I would have been grateful under any circumstances, but nearing the end of a journey that has had its share of ups and downs, I was touched beyond belief to know that just down the road and across the river, there was a small group of people — just plain good people with nothing to gain or lose — who had my back. Miles de gracias a la familia Prada! Miles de gracias a todos who in the past few months have had my back! Spain, here I come! 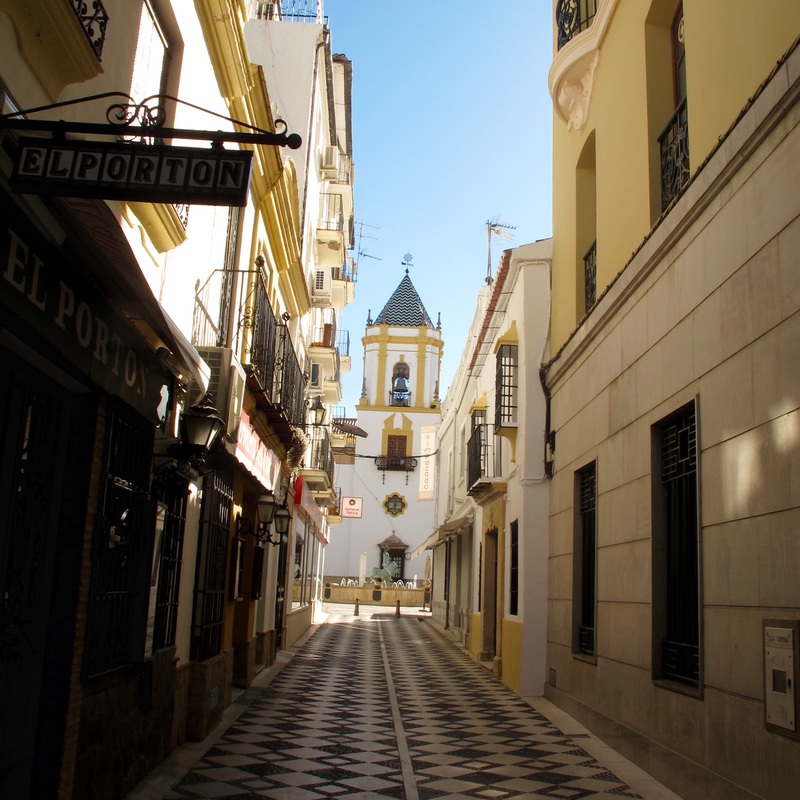 I spent my junior year in Seville. It was the 1981-1982 school year. 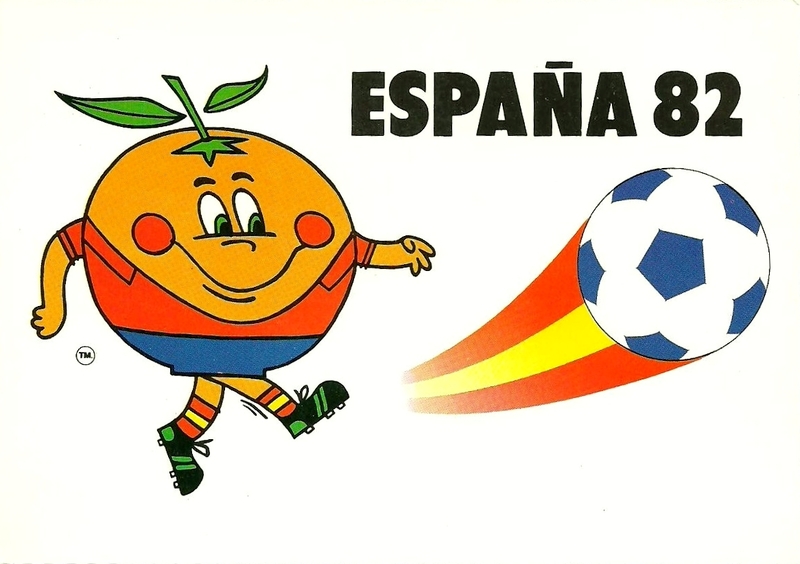 Felipe González was president, Spain’s entrance into NATO was a divisive issue, and soccer enthusiasts from around the globe descended on the Iberian Peninsula in the summer of ’82 for the World Cup. It was the first time I’d been abroad, and afterward my life veered very far away from my southern, suburban roots. I marveled bug-eyed at everything from the food, to the language, to the joyous sense of celebration that was a constant in the streets — whether it was something on a grand scale, such as the Feria de Abril in Seville, or gatherings at corner bars where many stopped on their way to work for a daybreak shot of cognac. 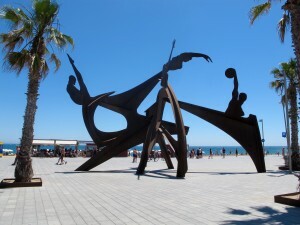 I plan to go back this fall to see what Spain is like 31 years later. Much has happened in that time, both in my world and in theirs.